For almost 40 years we have been providing horse-riding lessons for all levels of rider. Pony/horse riding in groups is not only good fun, but also very educational. We cater for young and old, for novices and experienced riders! At Equestrian Centre Bergemo pony/horse riding is taught on the basis of the FNRS Ruiterpaspoort (booklet used to record riding experience). Read more below! Our lessons are based on the FNRS Ruiterpaspoort. From dressage level F1 riders can progress to higher levels. Read more about the FNRS and the Ruiterpaspoort below. Click here for an overview and explanation of all FNRS dressage levels. Why are we affiliated with the FNRS? The FNRS aims to raise equestrian skills and improve the health of the equine population in the Netherlands. All FNRS Equestrian Centres accept the FNRS Ruiterpaspoort as proof of riding experience. To obtain proof of experience riders can also have their Ruiterpaspoort stamped at FNRS Equestrian Centre Bergemo. At the first ever presentation of stars, FNRS Equestrian Centre Bergemo has obtained four stars. On behalf of riders who ride weekly at Bergemo, we apply for a FNRS Ruiterpaspoort (booklet used to record riding experience), in which their progress is tracked, i.e. lessons, hacks/treks and dressage levels. 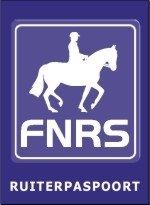 The FNRS Ruiterpaspoort is recognised throughout the Netherlands and can be used at any FNRS Equestrian Centre. (Annual) membership is good value, if you want to ride once a week. Are you interested? Ask our instructors what the possibilities are and which lesson is best suited for you. Pony riding: from €13,50 per lesson (based on an annual membership). Horse riding: from €16,00 per lesson (based on an annual membership). The afore-mentioned prices are excluding the costs for the FNRS Ruiterpaspoort, i.e. €20 per year. After having signed the membership contract, you will receive an invoice for €20 from the FNRS. Our lessons focus on the equine experience. We offer lessons with lots of variety as well special activities like horse jumping competitions, dressage tests and many other fun activities! Please check the diary for upcoming events! Why not join one of our regular classes? Please ask for options available. FNRS Equestrian Centre Bergemo was awarded a safety certificate on 3 February 2004, testifying to the fact that Bergemo promotes safe and responsible horse riding. For more information please go to: www.veiligpaardrijden.nl.